Wahoo! 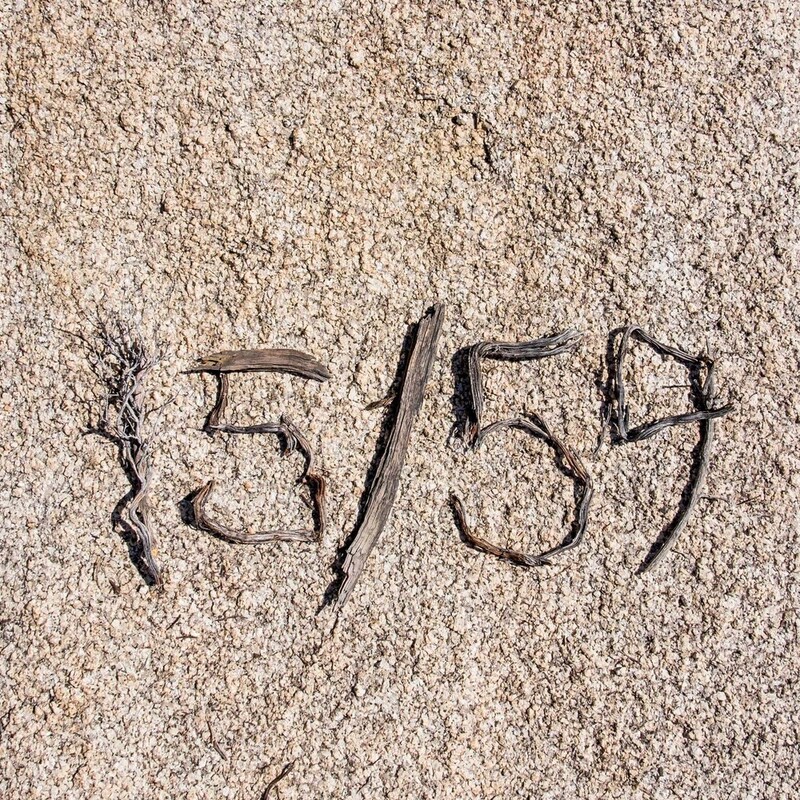 at Joshua Tree National Park. 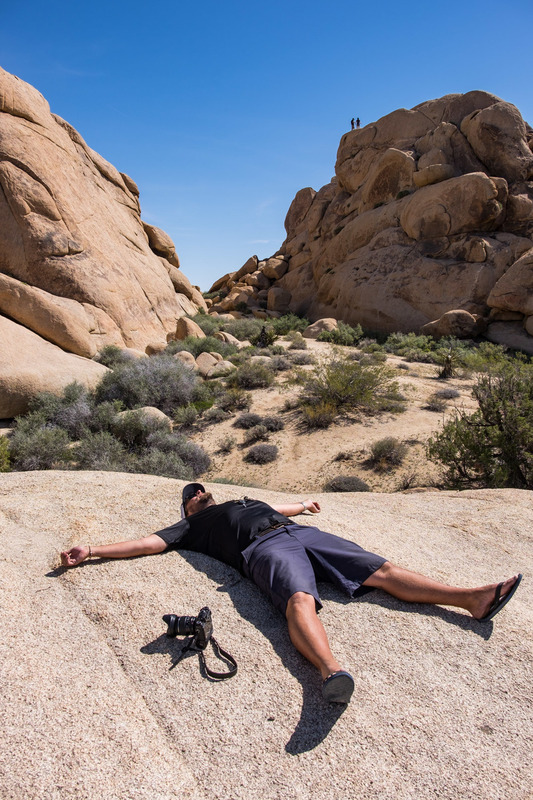 With 14 parks in the bag in just 10 short weeks, all we really wanted to do by the time we got to Joshua Tree was to relax and regroup, goof off and unwind for a minute. This park is ideal for that—it really is a perfect place to go play. It is also a perfect place to camp. 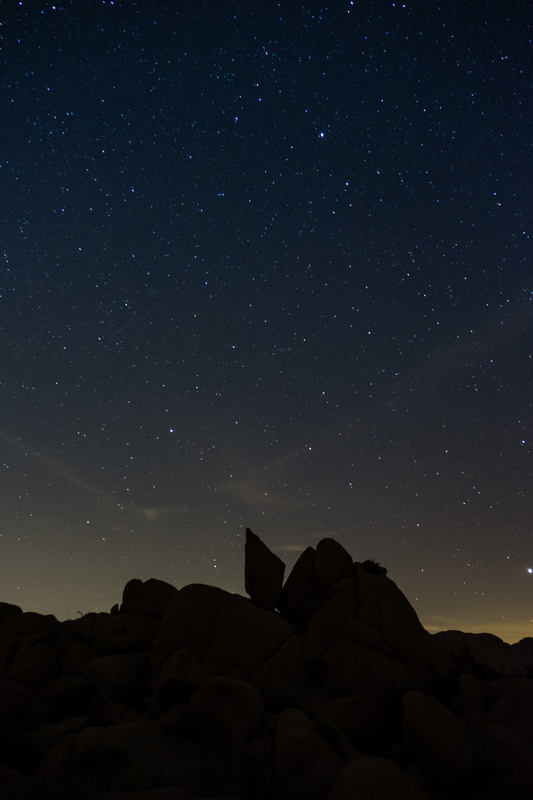 The clear skies and temperate spring climate found in the California desert makes pitching a tent, building a fire, and practicing the lost art of conversation a lot more relaxing. Luck was on our side the day we arrived, because not only did we find a campsite at the popular Jumbo Rock campground during a particularly busy week, but we found the best campsite one could possibly hope for—set beneath a balanced rock formation and a beautiful outreached tree that climbed upwards toward the sky. 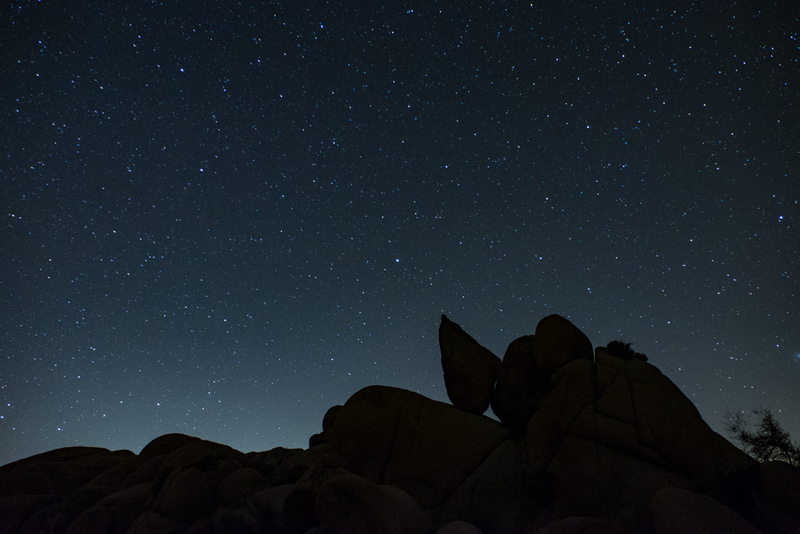 It was not only an “aw, that’s really nice” view; but a “brilliant, we can step outside of the tent in the middle of the night to capture star-stuff and photograph the sunrise five minutes after waking with coffee in hand” kind of view. A little dose of inspiration to kick off our park visit dedicated to relaxation. 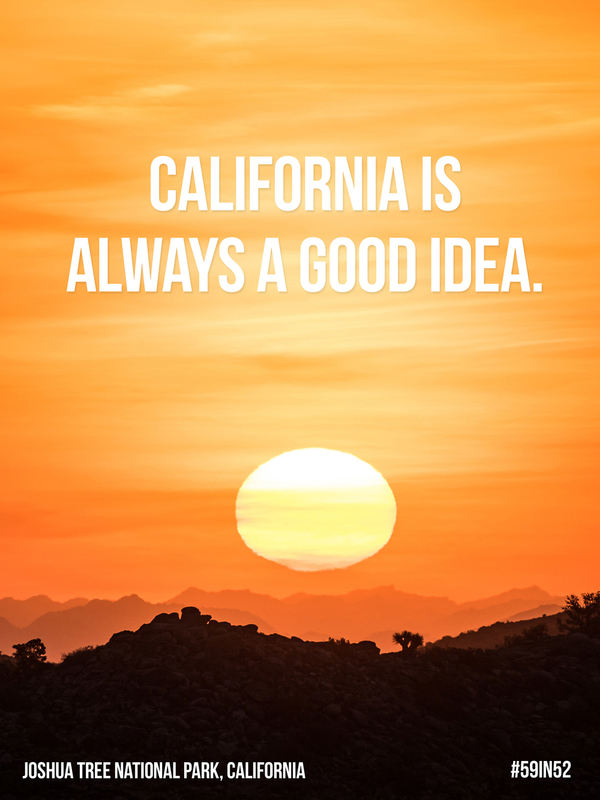 First, it’s easy to get there—just a couple hours east of L.A. and you are traversing well-maintained scenic roads from one awesome landmark to the next. Trails start flat and rise and fall over geological formations in all directions allowing families spanning generations to head off on the same trails together, adopting exertion levels that suit their personal ability. On the adventure front, climbers find here a world-class climbing and repelling playground. 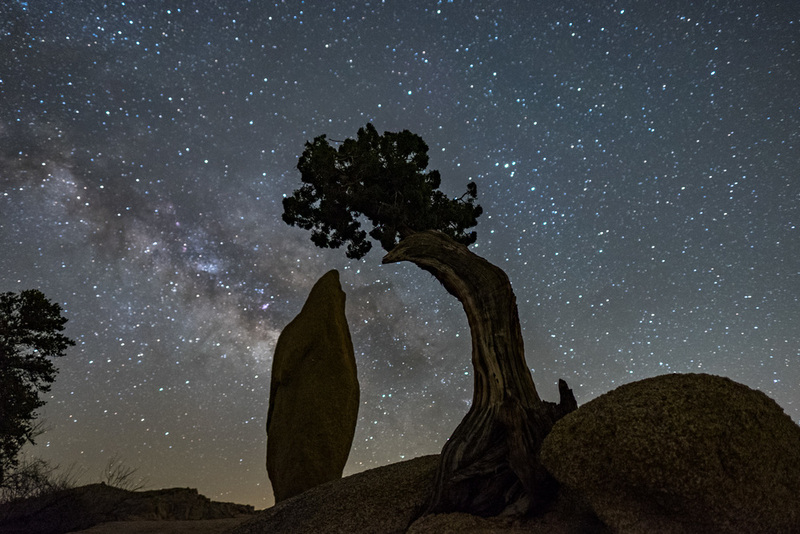 Photographers visit to capture silhouettes of wonder-shaped trees against the backdrop of the sun, moon, and stars. Equines go there to ride horseback, birders to bird, mountain bikers to ride, nature walkers to walk, campers to camp… It’s the “every man” park—a true wilderness playground. And for our hearts, there is inspiration. 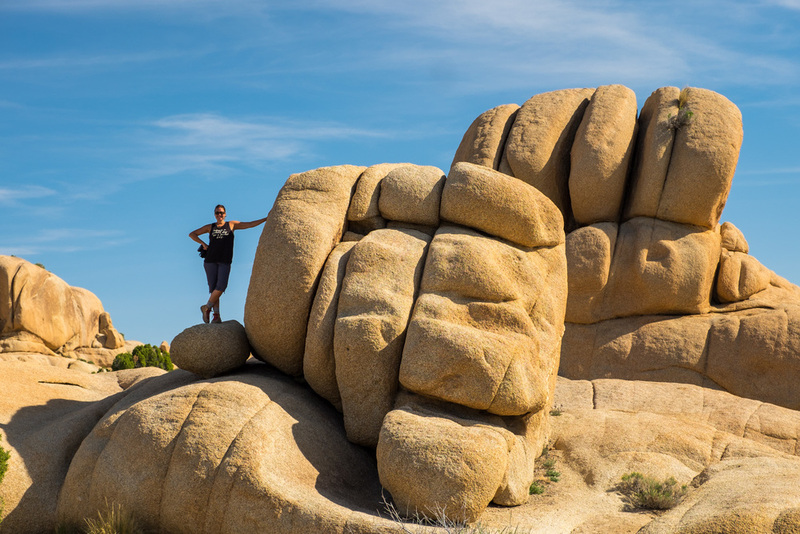 Famous artists and musicians have taken from Joshua Tree ideas that have manifested into creative works that we all know and love... anybody out there a fan of Dr. Seuss? How about U2, Selena, John Lennon, Victoria Williams, Keith Richards, Gram Parsons, and Jim Morrison? At a more grass-roots level, inspiration is gleaned every day in the park. 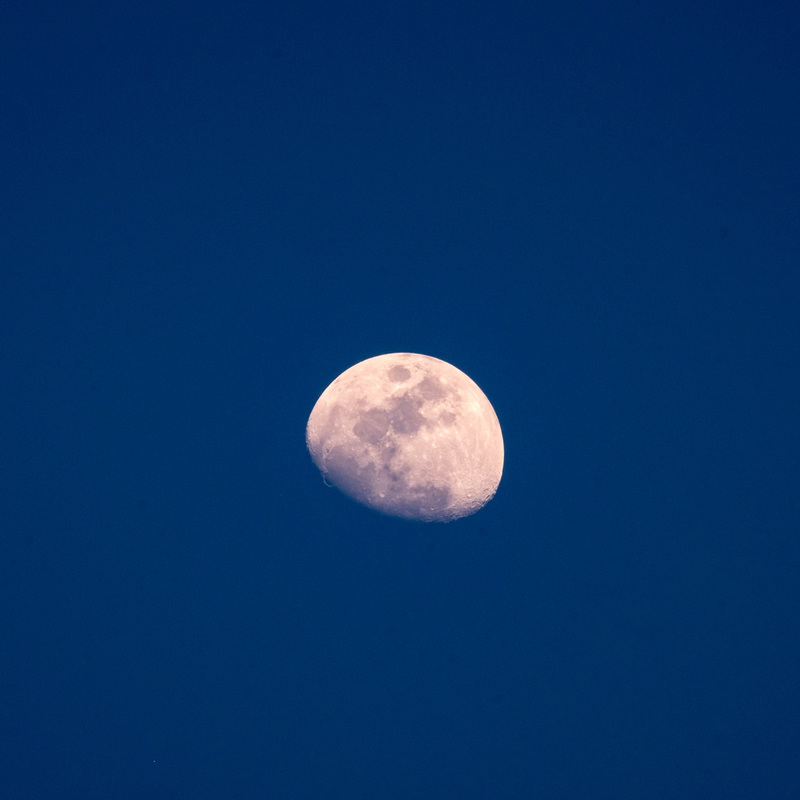 One can see the very act of discovery occurring all around. 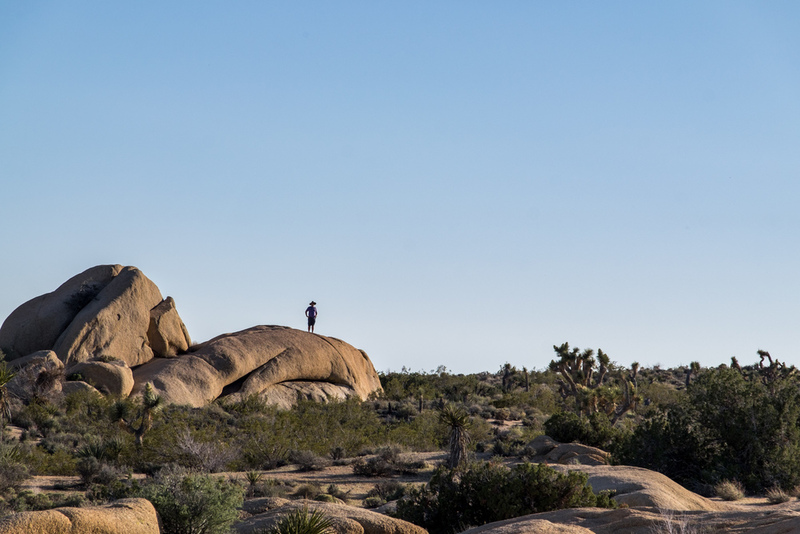 Kids scamper with cotton-tail rabbits through the brush and climb upon rock formations shouting to mom or dad, “can I go up here? 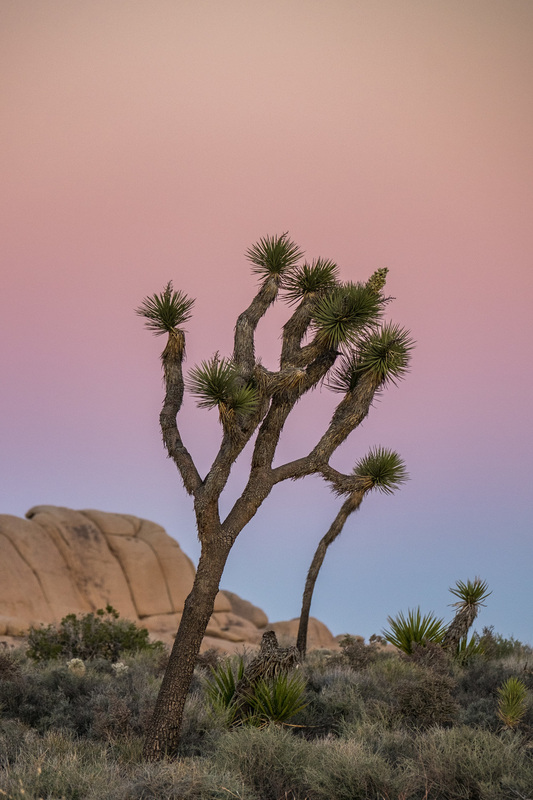 !” Grown-up kids stand aside Joshua Trees that are the park’s namesake taking selfies to share with their friends on Facebook and Insta. 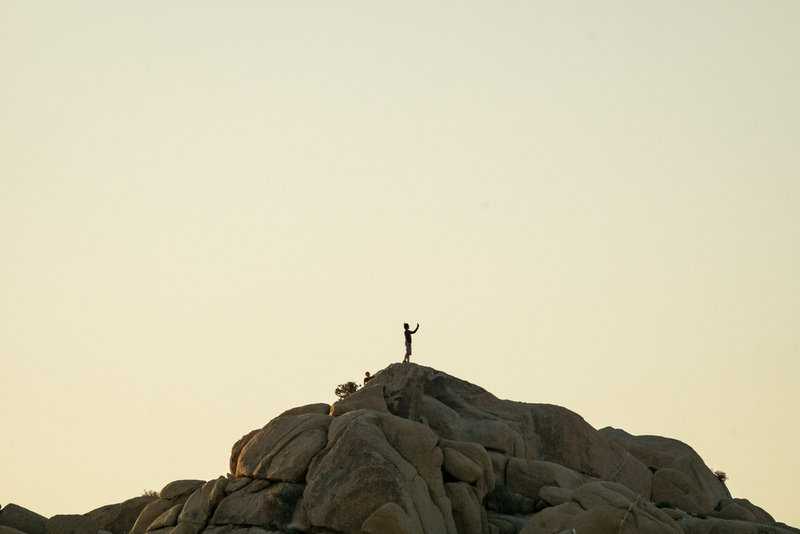 Solo explorers sit atop boulders looking into the distance taking in moments of solitude. 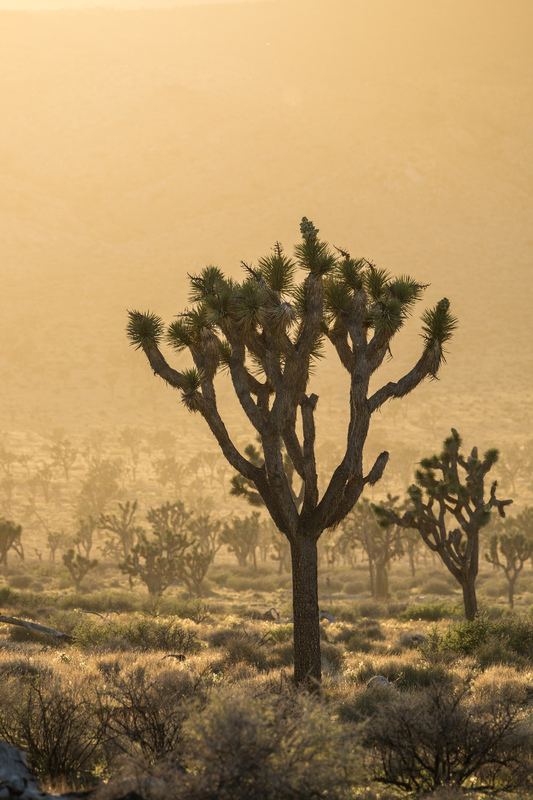 And then, there are the Joshua Trees themselves. Like snowflakes and fingerprints, each is one of a kind. 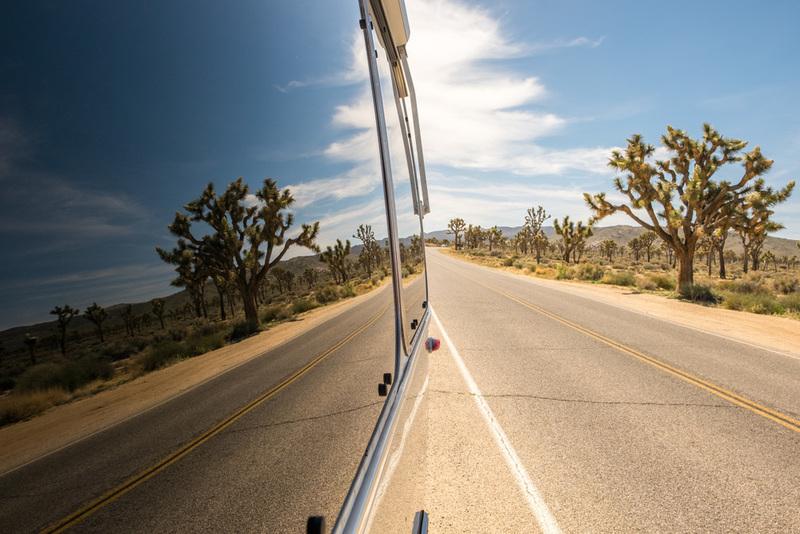 Every slight change of angle in your view produces what seems like an entirely different tree to look at. The sun shines, the birds soar, and it is just another stroke of great luck to be able to participate in the makeup of the landscape any day of the year. 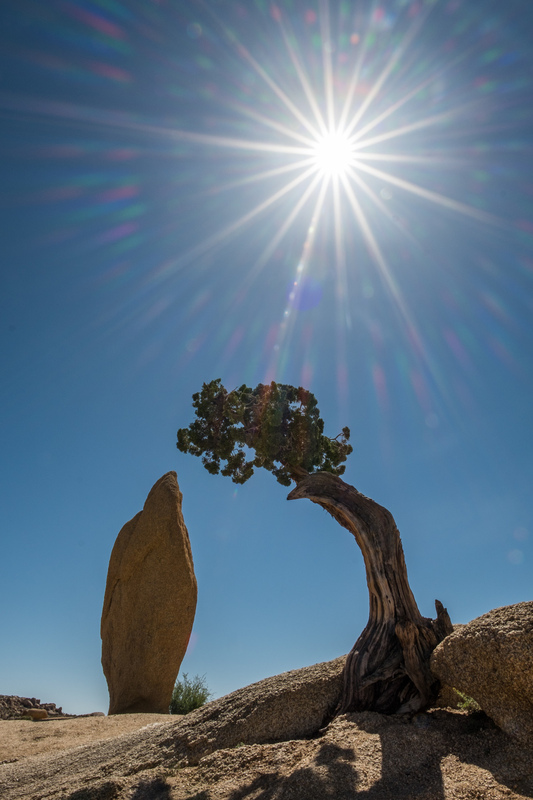 How the park got its name: According to the National Park Service and legend of old, Joshua Tree was given its name by Mormon pioneers traveling west in the 19th century who thought that the branches looked like the biblical figure Joshua, reaching up to the heavens in prayer. 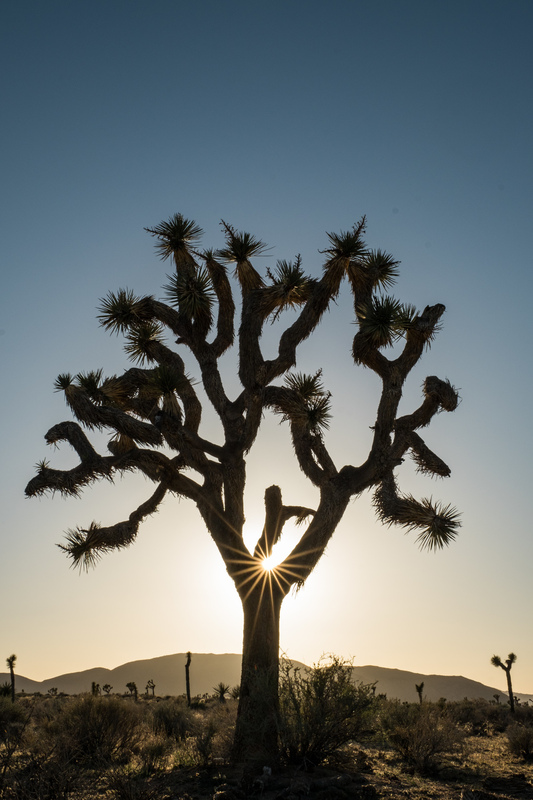 The iconic Joshua Tree captured during sunset. 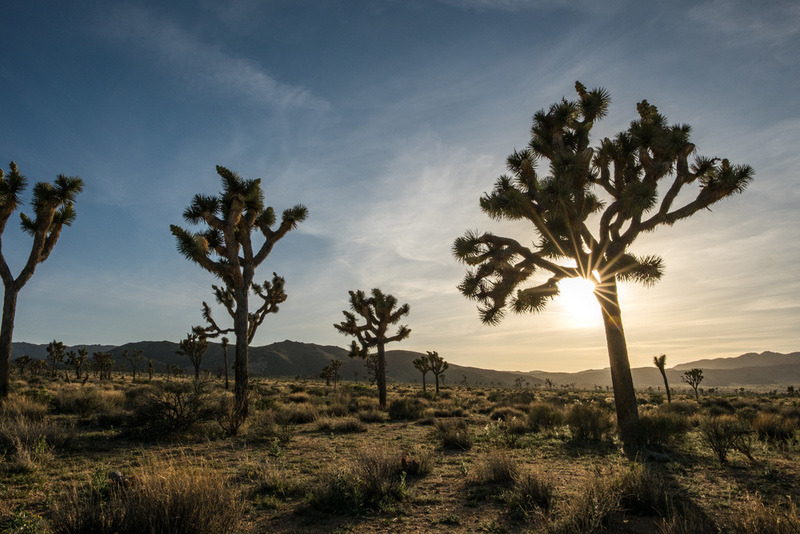 Iconic site in the park: There are many iconic sites in this park, but none more so than spots from where the Joshua Tree grows. 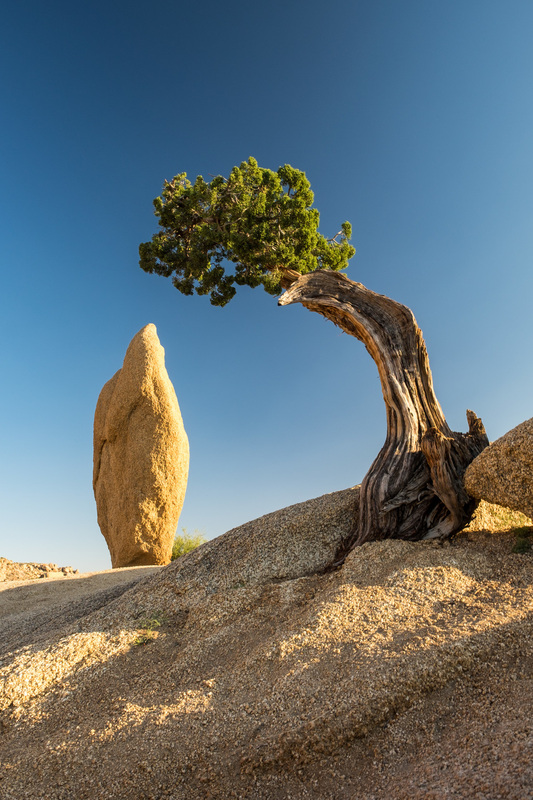 No two trees bare the same exact shape or composition. 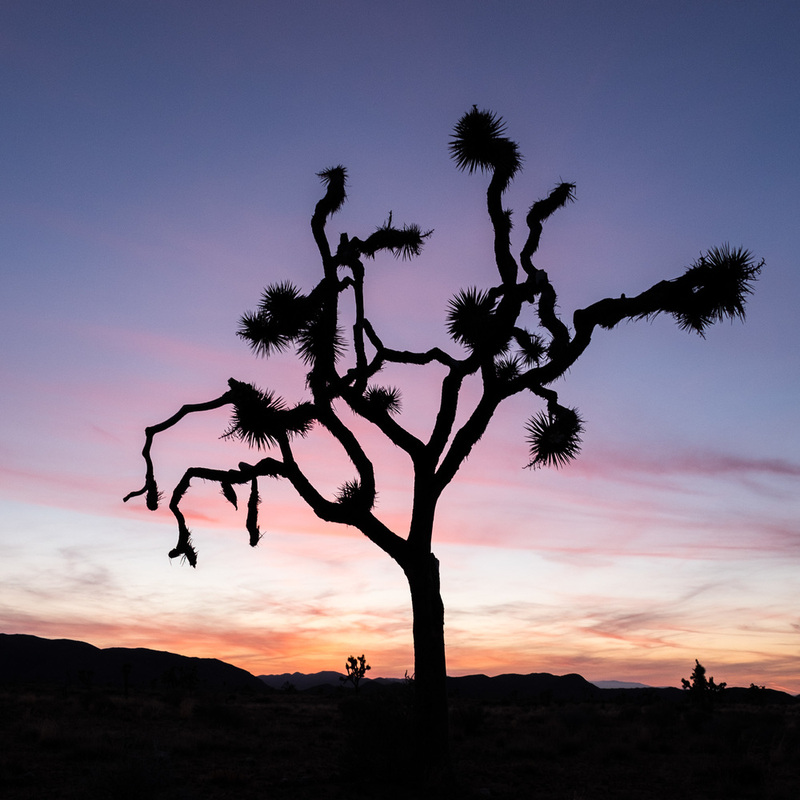 Their silhouette leaning against the desert sky sings songs of the Mojave Desert, the only place this “tree” (actually a yucca plant) naturally grows. 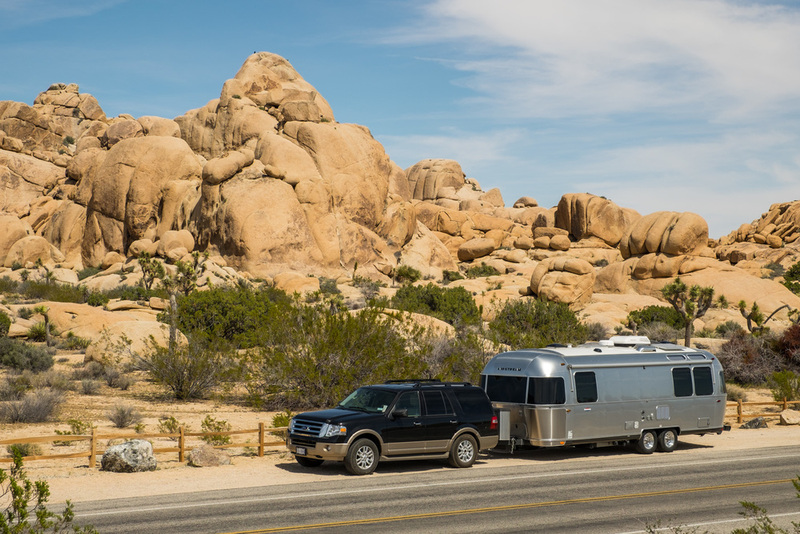 Accessible adventure: The Jumbo Rock campground is a centralized doorway to some of the best features of the park, and it seems that there is not one bad place to pitch a tent in it. 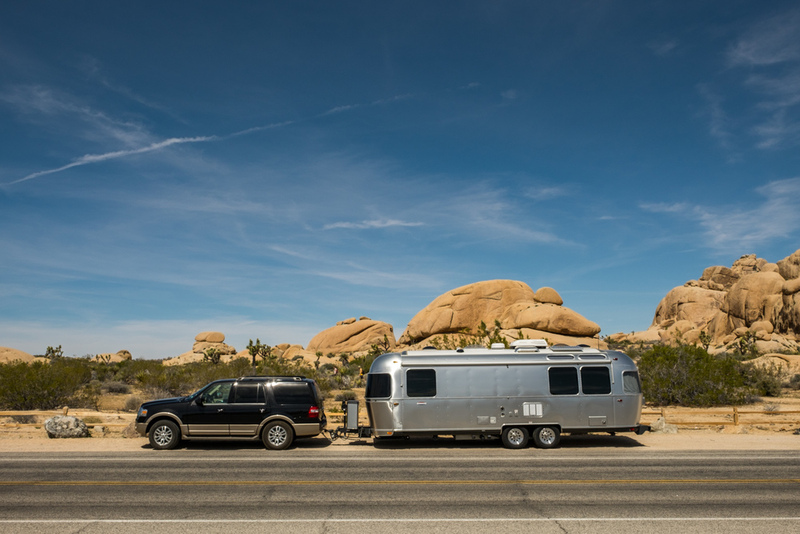 Each camping area has its own unique natural feature and miraculously, has at least some level of privacy. 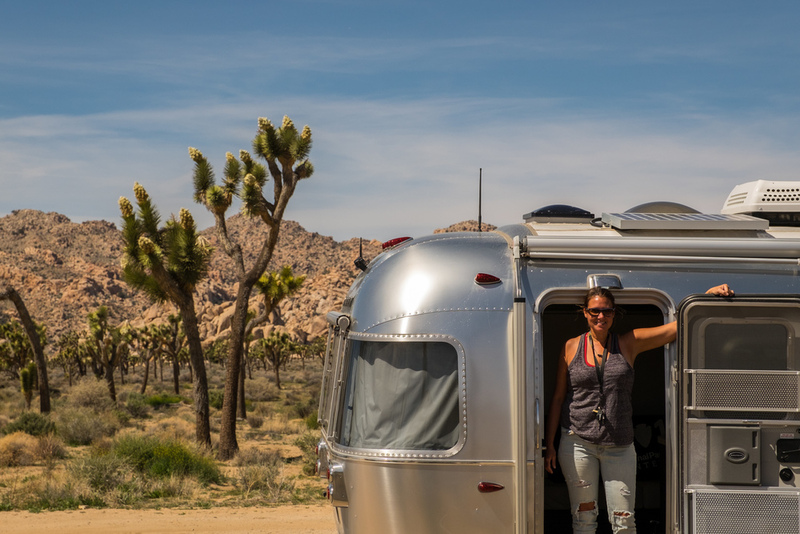 Drive in and choose your camping spot (first come, first served), pay the small fee, and set up camp just footsteps from your car. Try to arrive first thing in the morning so you can nab a good spot—this place is popular, and therefor busy all year long. Big adventure: Rock climbing! 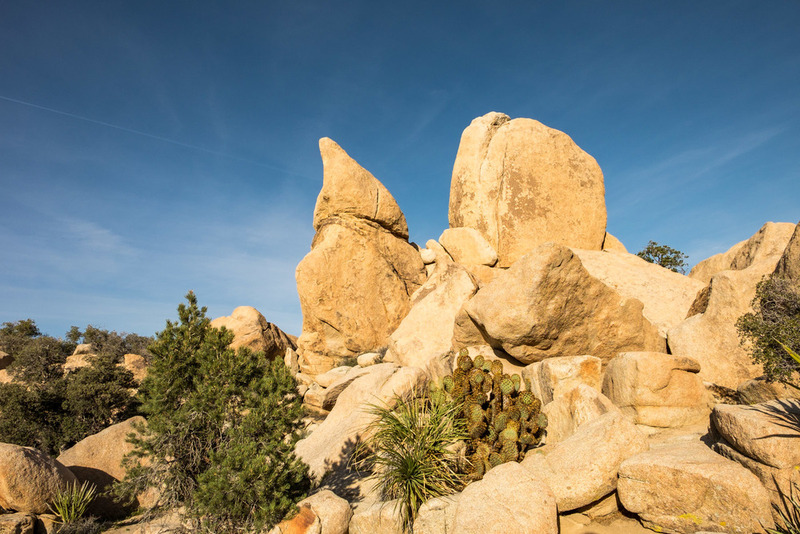 Joshua Tree is regarded as one of the best climbing destinations in the world, offering enthusiasts from around the world thousands of climbing routes to venture out on. 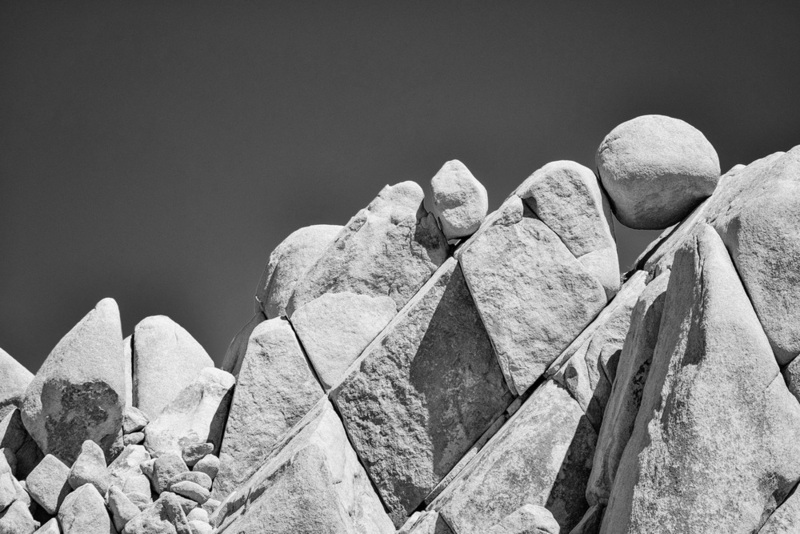 Rock climbing is not for the faint of heart -- proper equipment and training is mandatory. 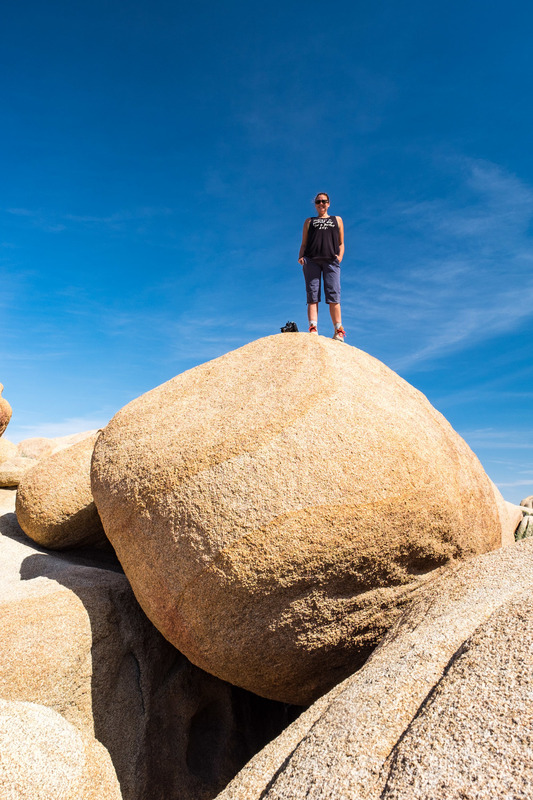 If you aren’t a technical climber, bouldering the tacky monzogranite rock faces offer another, really fun way to rise from the desert and catch panoramic views of this beautiful place. 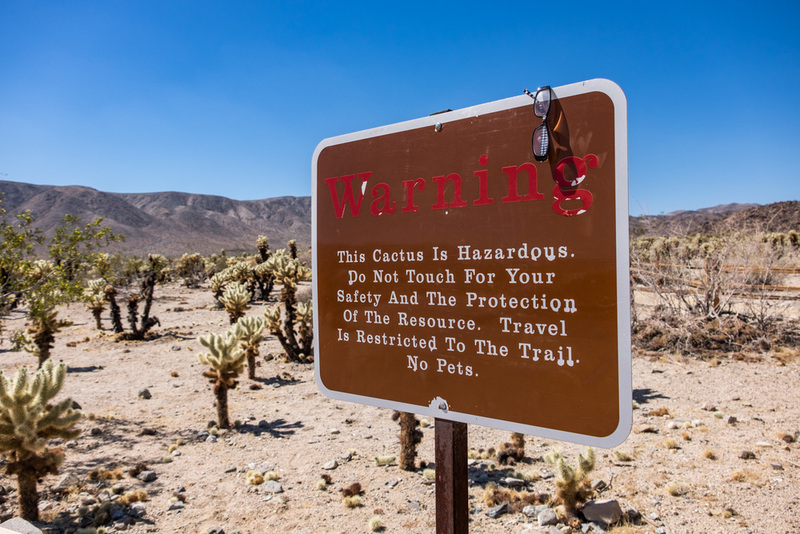 According the the National Park Service website, there are 93 miles of paved roads, 106 miles of unpaved roads; 9 campgrounds with 523 campsites, two horse camps, 10 picnic areas; and 32 trailheads reaching out to 191 miles of hiking trails throughout the park. 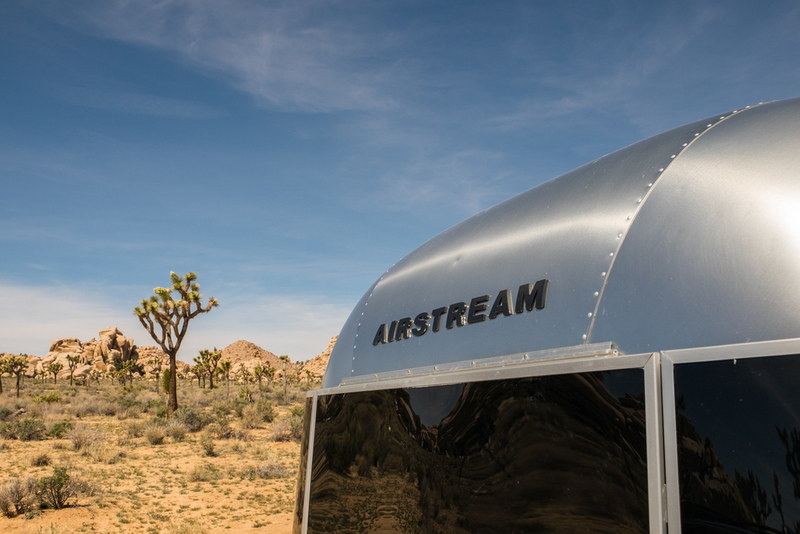 That’s a lot of access to Joshua Tree parkland! 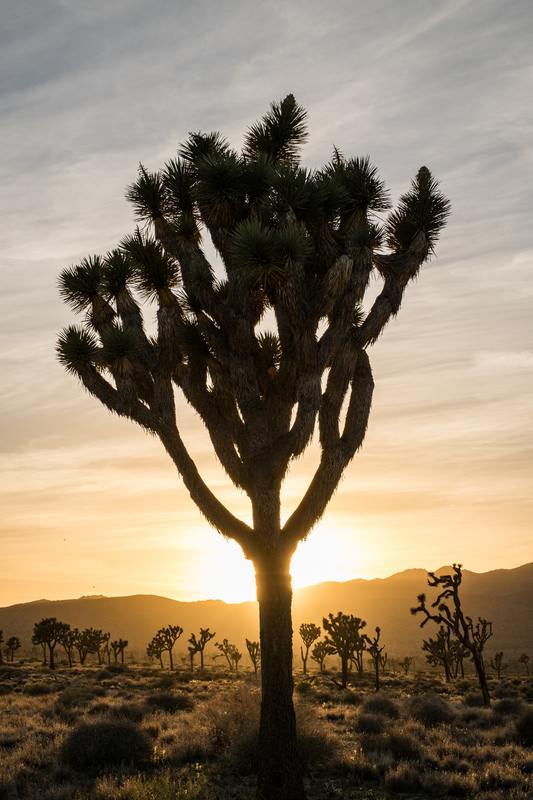 Joshua Tree has been called home by many cultures of people for 5,000 years. 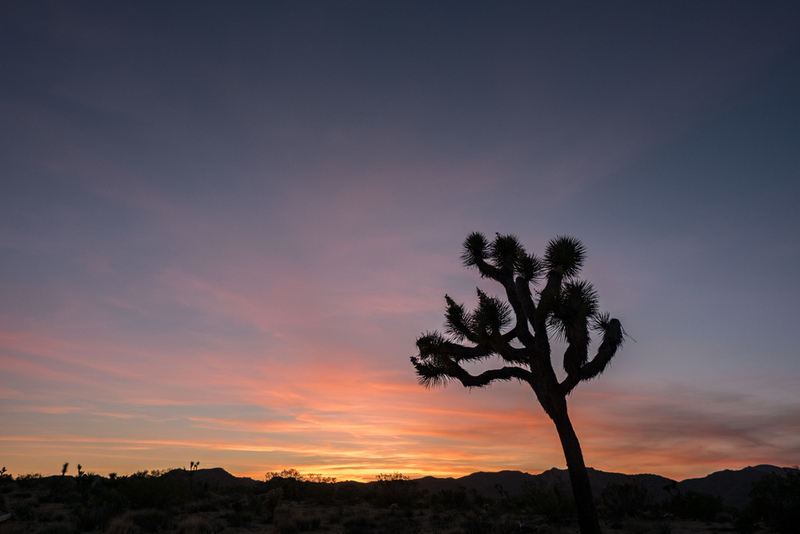 Pinto natives, American Indians, ranchers, miners; as well as diverse habitats of birds, wildlife and plant species find the Joshua Tree area to be a smart place to live. Homer Simpson, er, Skull Rock. 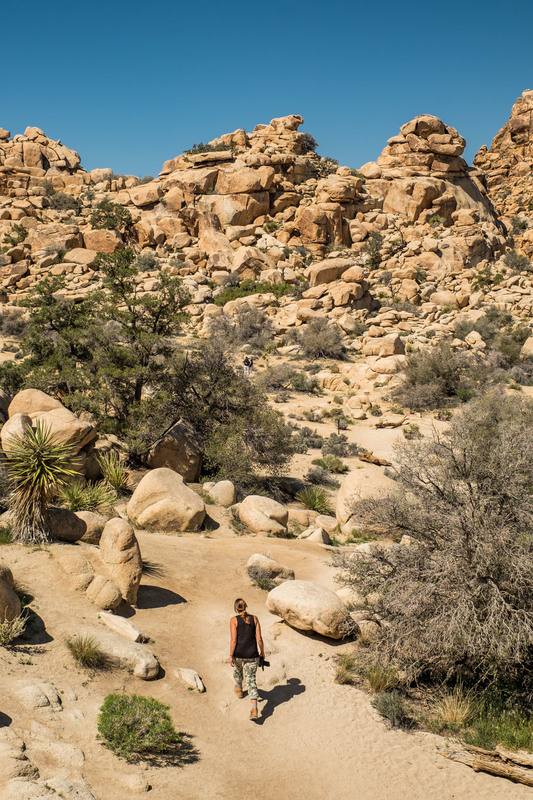 Minerva Hamilton Hoyt was one of the great early champions of Joshua Tree and helped it become a national moment in 1936, covering upwards of 800,000 acres. 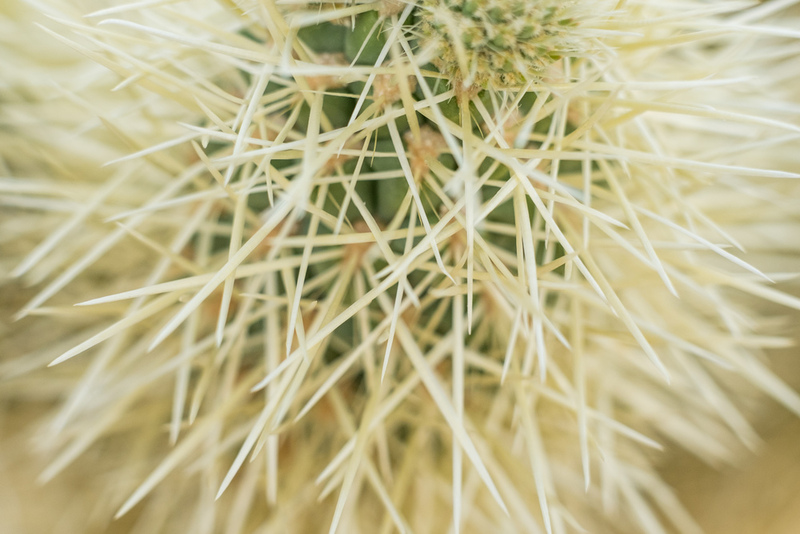 Minerva, a Pasadena local, got started in protest to cacti and Joshua Tree removal for use in desert gardens in Los Angeles. 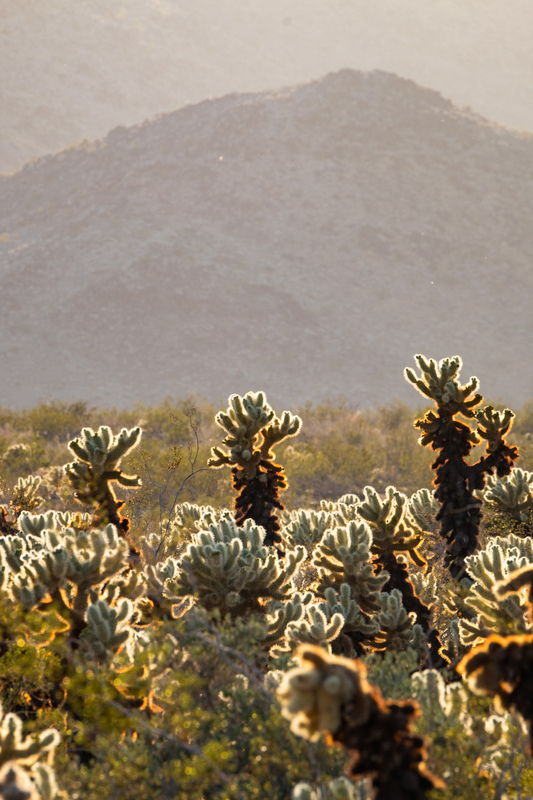 Some of the wildlife found in Joshua Tree includes: desert big horn sheep (you’ll see one if you’re lucky! 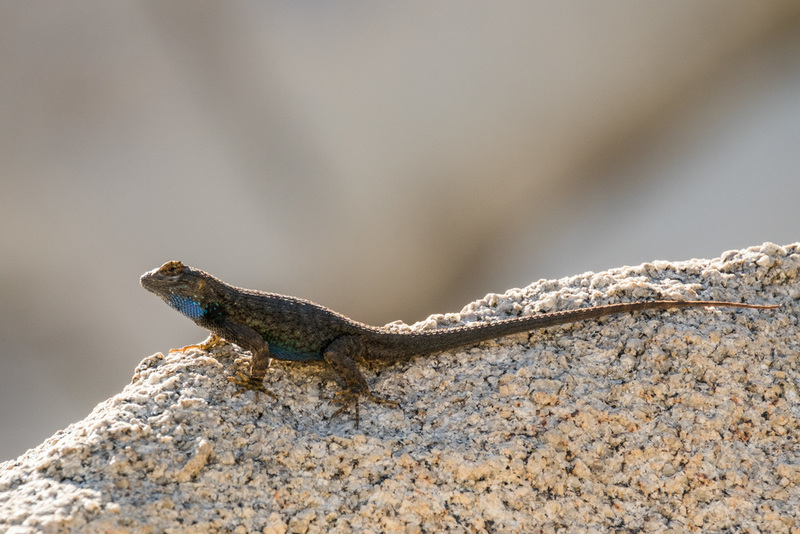 ), deer, roadrunners, cottontail rabbits, chuckwalla lizards, tree frogs, quail, and rattlesnakes. 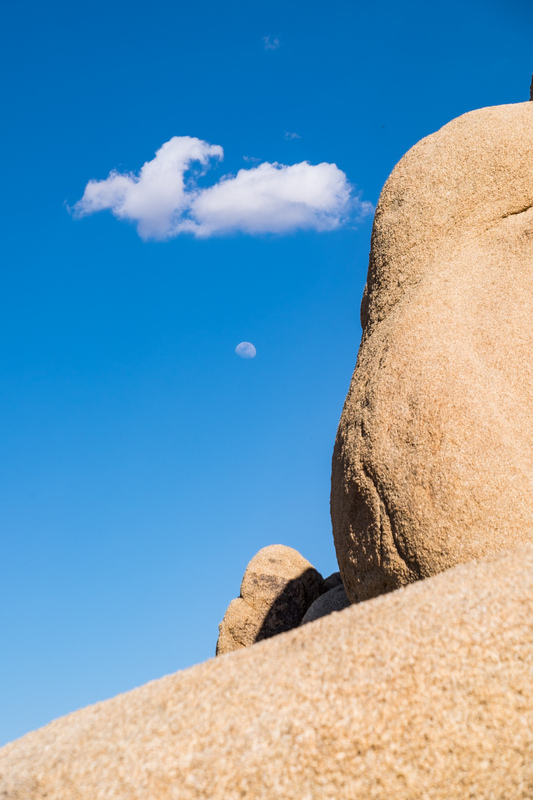 Skull Rock is a face-like formation that kicks off a 1.7-mile hike around Jumbo Rock campground. We think it looks like Homer Simpson. 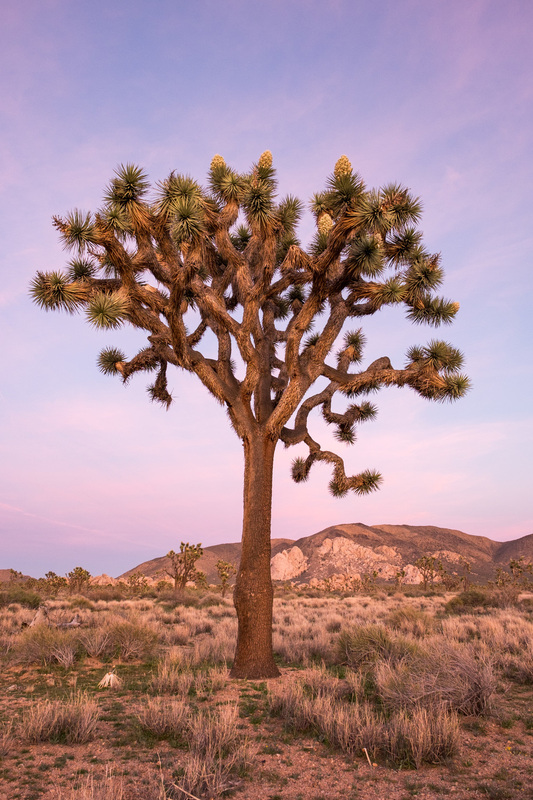 Joshua tree blooms in full expression during spring, 2016. 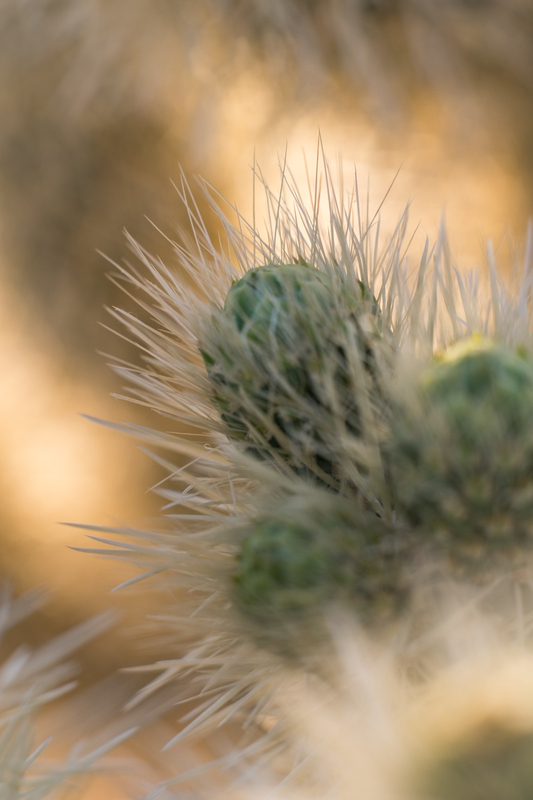 Cover art of the first Eagles album (released in 1972) was captured in the Cholla Garden—one of our favorite places in the park. 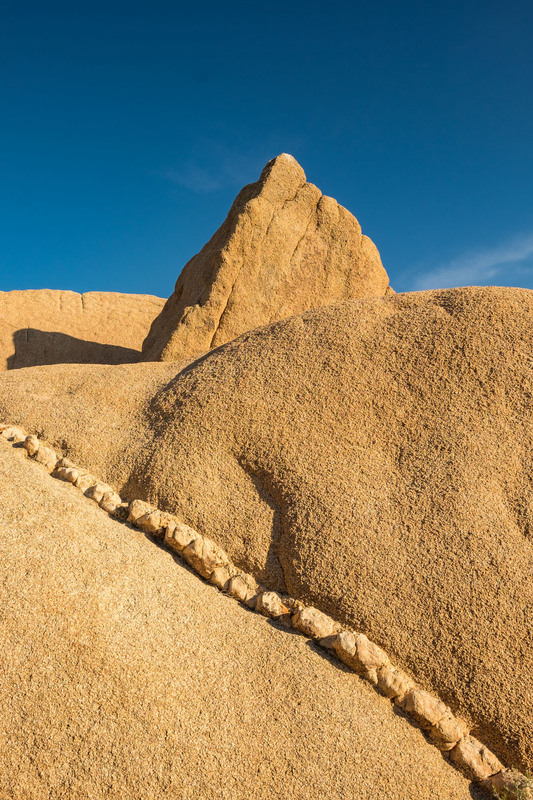 Tejano superstar Selena filmed her "Amor Prohibido" music video at Joshua Tree. 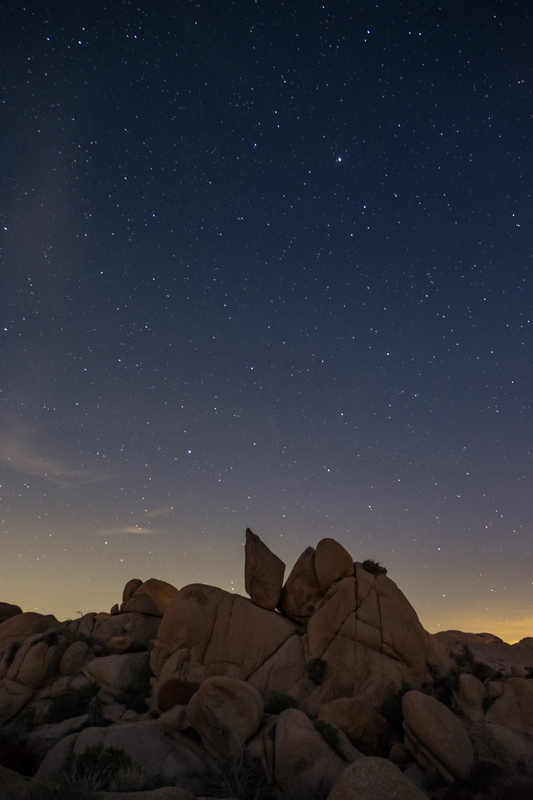 The Joshua Tree National Park Association is the non-profit for the National Park, and in partnership supports an annual Art Festival and also an Artist-in-Residence program. A contemporary art scene has recently popped up in the area. Anthony Bourdain filmed an episode of No Reservations in Joshua Tree with songster Josh Homme (from the rock band Queens of the Stone Age,) who was born there. 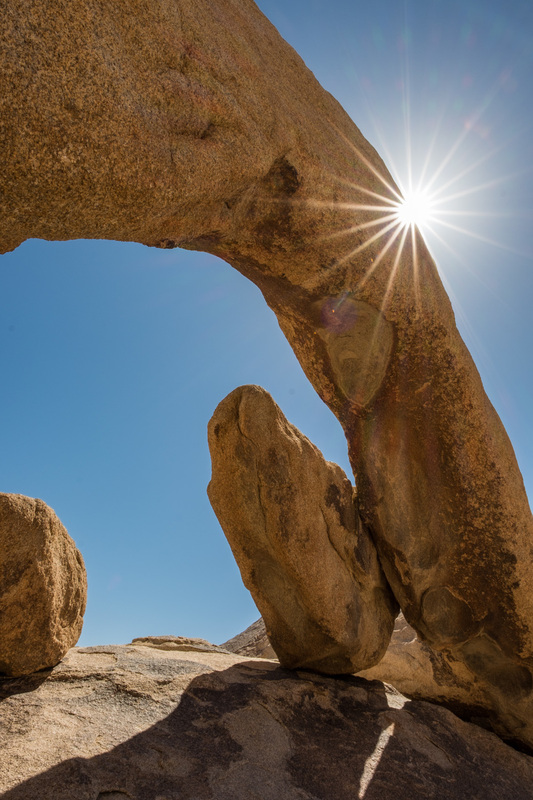 The boulders that Joshua Tree National Park is comprised of is a result of billions of years of heating and cooling of the Earth’s crust, and the effects of wind, sun, and erosion. 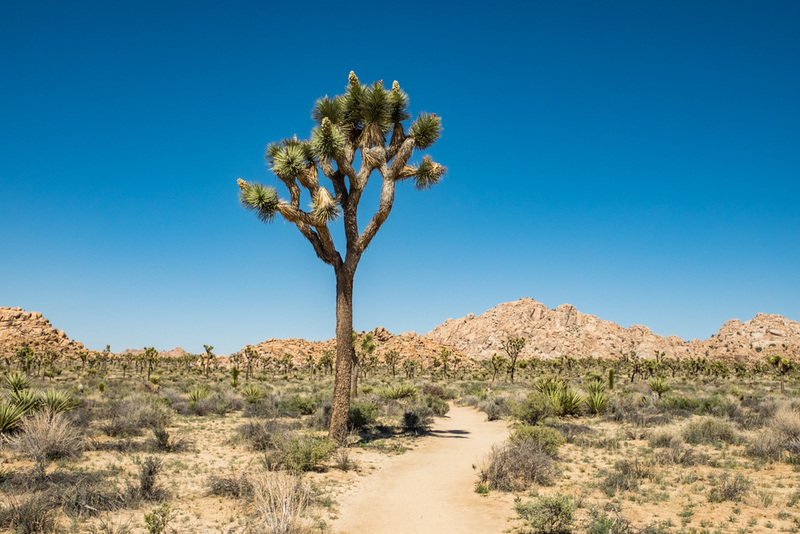 Joshua tree blooms and wildflowers are a huge draw to the park.